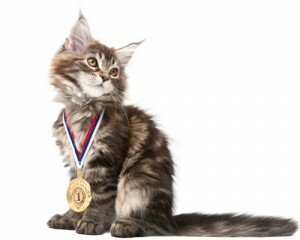 Putting a medal on a cat might seems way easier than putting jam on one – but the ‘jam’ has to come first! After a conversation with Matt Galloway, the host of CBC Radio’s Metro Morning ( Toronto, RadioOne) a podcast of our conversation and this article was posted on CBC Books web site. Their title is partly right… but the truth of the “Jammed Cat” is that it helps anyone achieve any goal, big or small. In no way is the Power of More about Olympic size goals only. Three-time Canadian Olympic gold-medalist Marnie McBean knows it’s a weird concept. But she can’t help comparing her journey to becoming Canada’s most successful summer Olympic athlete to a cat slathered in jam. One day, McBean’s jam-covered piece of toast fell, she told Metro Morning. Of course, the toast fell jam side down. It always does. Most people, would make a new piece of toast, but McBean started wondering if there was any way to stop the open-faced sandwich from falling that way. She let the idea go, but it came up again when she started working with other athletes, mentoring and preparing them for the Olympic games. She realized athletes are often happy with their performance, but unhappy with the overall result. Imagine logging a personal best for a marathon, but not placing in the top three. She advises people to break down their goals, making them small steps to a large accomplishment. Picture yourself today, she says, and then picture who you want to be in the future. Start connecting those two images with other pictures, creating a photo album of smaller goals. This entry was posted in Marnie in the News and tagged goal setting, Power of More by Marnie. Bookmark the permalink. Hi Marnie, I still remember meeting you on the summit of Mt. Kilimanjaro in 2002 and how very gracious you were – what a treat! A few weeks ago I actually posted the photo on my Fan page, High on Life!